I finally published my book in August of this year. Originally I was just going to have an e-book, but after requests for a physical paperback version I worked out the formatting. I'm glad I did — it looks nice! With 2017 coming to a close, I wanted to put together a list of highlights like I did last year. This year was the year of dynamic information equilibrium as well as presentations. It was also the year I took some bigger steps in bringing my criticisms of economics and alternative approaches to the mainstream, having an article at Evonomics and publishing a book. I'd like to thank everyone who reads, follows and shares on Feedly and Twitter, or who bought my book. It is really only through readers, word of mouth, and maybe your own blog posts on information equilibrium (like at Run Money Run) that there is any chance the ideas presented here might be heard or investigated by mainstream economists. I'd also like to thank Cameron Murray for a great review of my book, Brennan Peterson for helping me edit my book, as well as Steve Roth at Evonomics (and Asymtosis) for being an advocate and editor of my article there. The biggest thing to happen was the development of the dynamic information equilibrium approach to information equilibrium. The seeds were planted in the summer of 2014 in a discussion of search and matching theory where I noted that the rate of unemployment recovery was roughly constant — I called it a "remarkable recovery regularity". Another piece was looking at how the information equilibrium condition simplifies given an exponential ansatz. But the Aha! 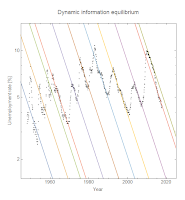 moment came when I saw this article at VoxEU.org that plotted the log of JOLTS data. I worked out the short "derivation", and applied it to the unemployment rate the next day. 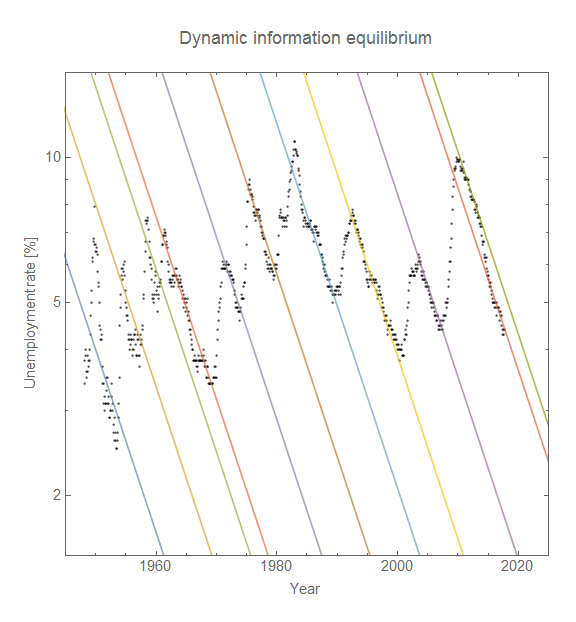 Since that time, I have been tracking forecasts of the unemployment rate (and other measures) using the dynamic equilibrium model. I even put together what I called a "dynamic equilibrium history" of the US contra Friedman's monetary history. As opposed to other economic factors and theories, the post-war economic history of the US is almost completely described by the social transformation of women entering the workforce. Everything from high inflation in the 70s to the fading Phillips curve can be seen as a consequence of this demographic change. Instead of haphazardly putting links to my Google Drive, I finally created Github repositories for the Mathematica (in February) and eventually Python (in July) code. But the most important thing I did theoretically was rigorously derive the information equilibrium conditions for ensembles of markets which turned out to be formally similar equations to individual markets. This was a remarkable result (in my opinion) because it means that information equilibrium could apply to markets for multiple goods — and therefore macroeconomic systems. In a sense it makes rigorous the idea that the AD-AS model is formally similar to a supply and demand diagram (and under what scope it applies). The only difference is that we should also see slowly varying information transfer indices which would manifest by e.g. slowing growth as economic systems become large. 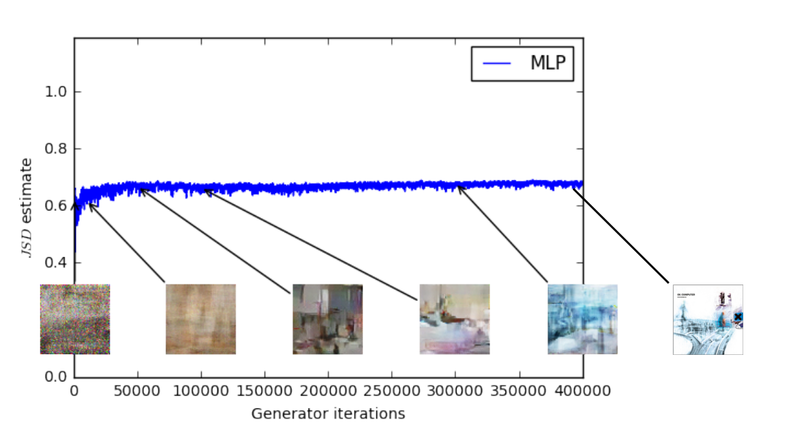 These are nascent intuitions, but there are strong formal similarities between information equilibrium and Generative Adversarial Networks (GANs) as well as a theoretical connection to what is called the "information bottleneck" in neural networks. I started looking into it this year, and I hope to explore these ideas further in the coming year! Over the past year or so, I think I finally reached a point where I sufficiently understood the ideas worked through on this blog that I could begin outreach in earnest. In May I published an article at Evonomics on Hayek and the price mechanism that works through a the information equilibrium approach and connection to Generative Adversarial Networks (GANs). 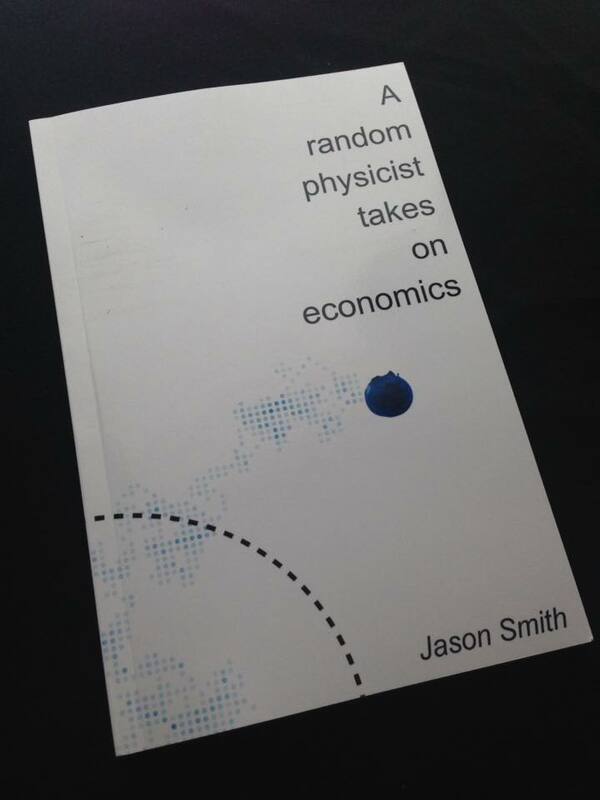 In August, I (finally) published my book on how I ended up researching economics, on my philosophy to approaching economic theory, as well as some of the insights I've learned over four years of work. 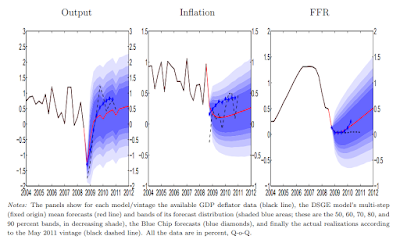 I also put together four presentations throughout year (on dynamic equilibrium, a global overview, on macro and ensembles, and on forecasting). Several of my presentations and papers are collected at the link here. In November, I started doing "Twitter Talks" (threaded tweets with one slide and a bit of exposition per tweet) which were aided by the increase from 140 to 280 characters — in the middle of the first talk! They were on forecasting, macro and ensembles, as well as a version of my Evonomics article. Thanks for reading everyone! This blog is a labor of love, written in my free time away from my regular job in signal processing research and development. This is the most interesting econ blog I read, and I read many. I don't buy the approach, but interestingly, nor can I say it's wrong. Hence, I'm glad someone's exploring this problem space. It's certainly possible there're some important insights offered by this approach, even if it's not entirely correct. For some reason, my intuition tells me no one is modeling expectations correctly. The application of the concept of entropy here doesn't sit right to me. It seems like one of those physics or information theory analogies pushed too far, but again, can't say it's wrong. Of course, I also don't think I understand the model completely, simple though it is. In some ways, I'd like this model to be valid, as it's more elegant than traditional approaches. There is really nothing more pathetic than to have an economist or a retired engineer try to force analogies between the concepts of physics and the concepts of economics. How many dreary papers have I had to referee in which the author is looking for something that corresponds to entropy or to one or another form of energy. Information theory provides shortcuts which allow one to deal with complex systems. That is to say it should be thought of as a more general complex systems approach rather than a physics analogy from thermodynamics. In fact, I frequently have acolytes of Duncan Foley asking if I've ever read his papers (which I have as any competent researcher would at least google "entropy economics" before thinking they had something new). However, Foley is an example of pushing an analogy too far equating prices with temperatures and utility with energy. So yes, I am aware of this issue -- as well as the more general issue of simply being a crackpot. I saw a friend from graduate school a couple weeks ago after I had published my book. He told me a story about some guy who had crackpot gravity theories, but found a millionaire patron and he had since seen him presenting at a side session at a physics conference. This was probably intended as both advice (I should find a millionaire patron) and warning ("remember the crackpots we used to get emails from in physics?"). And it's generally something I always try to keep in mind. There doesn't seem to be enough data to definitely, but you do a great job of clarifying questions and exposing problems with models. How is the CPI forecast holding up?